110-years old Stollers to Cumbria's aspirational homeowners. Challenge: Persuade style-conscious homeowners in Cumbria to drive down Britain’s longest cul-de-sac to Barrow-in-Furness, to see the new-look Stollers. Approach: Devise new positioning and customer acquisition strategy to encourage footfall from further afield. Results: Increase in visits from new customers, leading to higher average order values, a 10% uplift in overall sales values and 8% increase in new user web traffic. 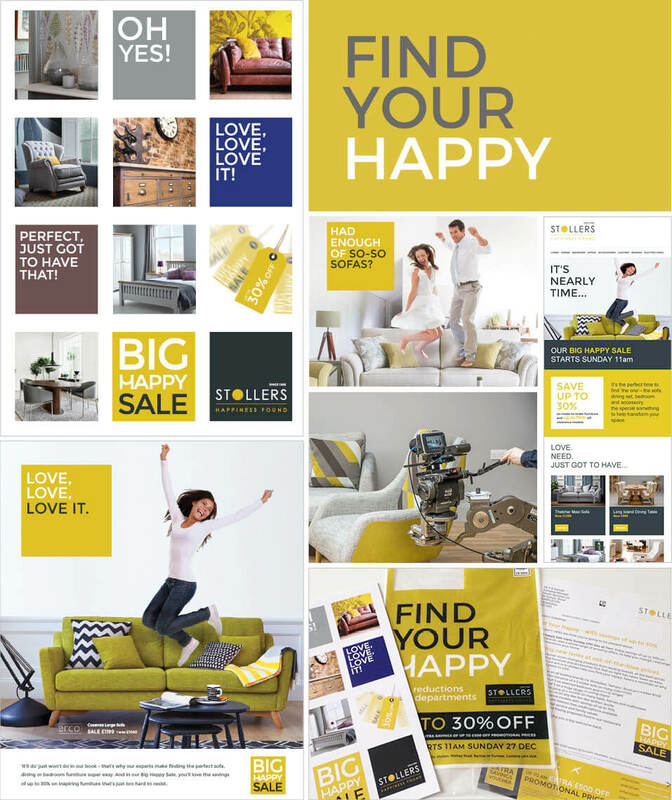 Brand-building: MOSAIC customer analysis; ‘Happiness Found’ positioning and identity development; television (ITV Border and Sky Adsmart), cinema, outdoor, radio and lifestyle magazine advertising. Lead generation: Targeted door drops, email marketing, direct mail, local press, online display. Conversion: In-store point of sale, print collateral. Inspiring people to live a life less ordinary - 'experience different' at Shackletons. Challenge: Transform a one of a kind, family-owned country store into the Ribble Valley’s ‘must visit’ home and garden destination. 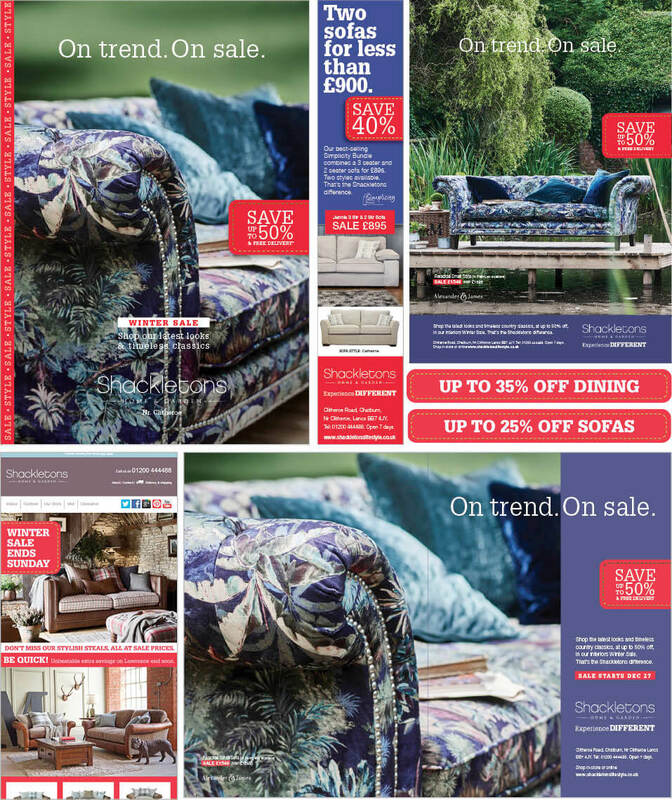 Approach: Develop a long-term strategy and seasonal promotional campaigns for Outdoor Living and Interiors, in order to increase footfall from new shoppers within 60 mins drive time. 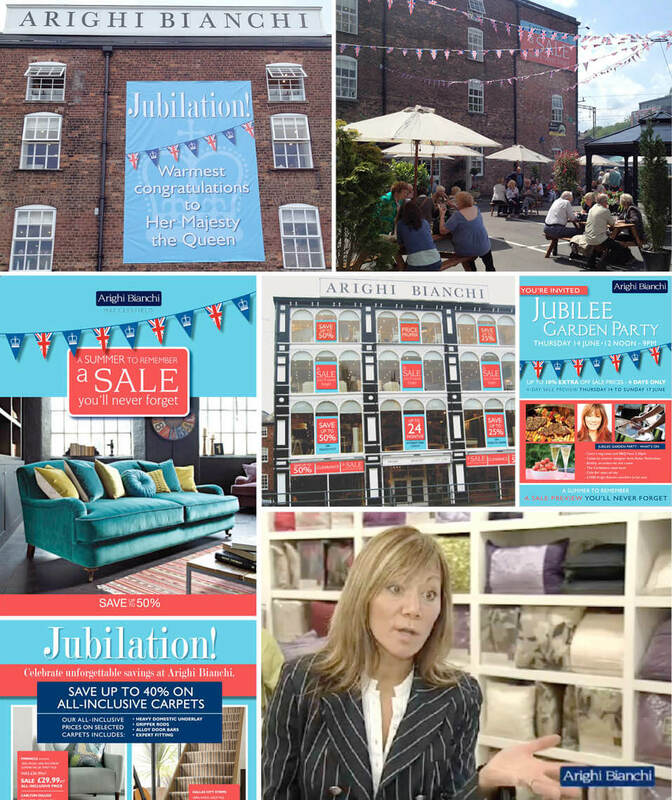 Results: Significant increase in seasonal footfall; successful launch of interiors department and own label product ranges, and over 300% increase in interiors sales values over four years to date. Brand-building: ‘Experience Different’ positioning and Identity; lifestyle magazine advertising; editorial product placement; online display. Lead generation: Targeted door drops; email marketing; search engine marketing; direct mail. Conversion: eCommerce website design & build (Magento); in-store point of sale; photography/CGI; print collateral. 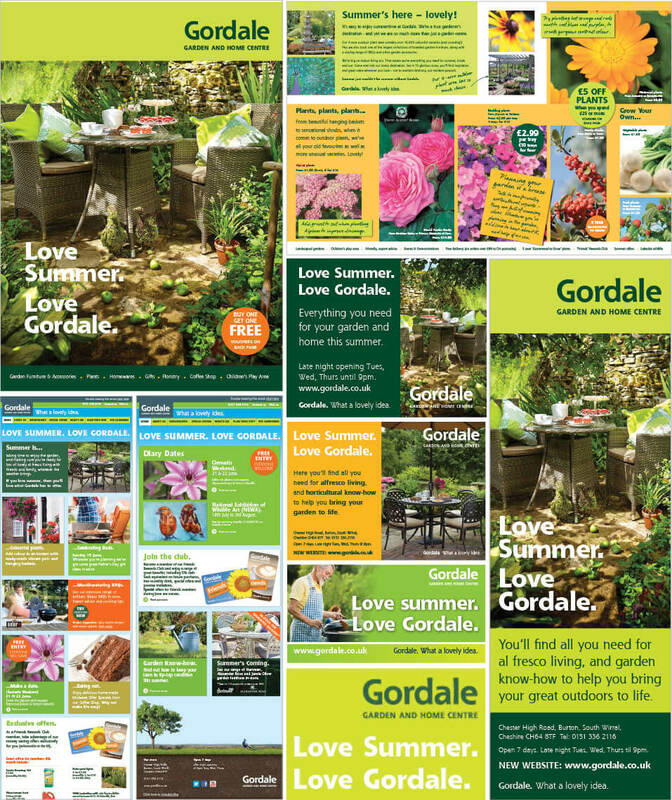 'What a lovely idea’ - lots of reasons for more people to give Gordale a go. CHALLENGE: Change outdated perceptions of one of the country’s original post-war garden centres. APPROACH: Develop a long-term strategy designed to increase footfall from new and lapsed shoppers within 45 mins drive time. RESULTS: Transformation into a genuine regional destination store, with successive annual increases in footfall, web traffic and turnover, and GCA Top 200 Garden Centre of Excellence 2017 ranking up to 7 from 21 in three years. Brand-building: ‘What A Lovely Idea’ positioning and Identity; television (Sky Adsmart); lifestyle magazine advertising; out of home advertising; editorial product placement. Lead generation: Targeted door drops; email marketing; local press. Conversion: Website design & build (WordPress), in-store point of sale/signage, print collateral, loyalty programme. CHALLENGE: Reduce reliance on a sizeable (100K+) but ageing customer base, whIch accounted for 80% of new sales. APPROACH: Target new style-conscious homeowners within 60 mins drive time. RESULTS: Transformation from ‘expensive, old fashioned’ to a must-visit, aspirational lifestyle store and rebalancing of sales values from new (35%) versus repeat customers (65%). Brand-building: Qual/quant research; ‘You’ve Arrived’ positioning and identity; lifestyle magazine advertising; editorial product placement; PR and social. Lead generation: Direct mail; email marketing; targeted door drops; local press advertising; search engine marketing; SMS; local radio; SEO & PPC. Conversion: eWebsite design & build (Python), in-store point of sale, print collateral, photography, video production, event management. ‘Here’s a thought’ - how to evolve Bents beautiful living positioning. 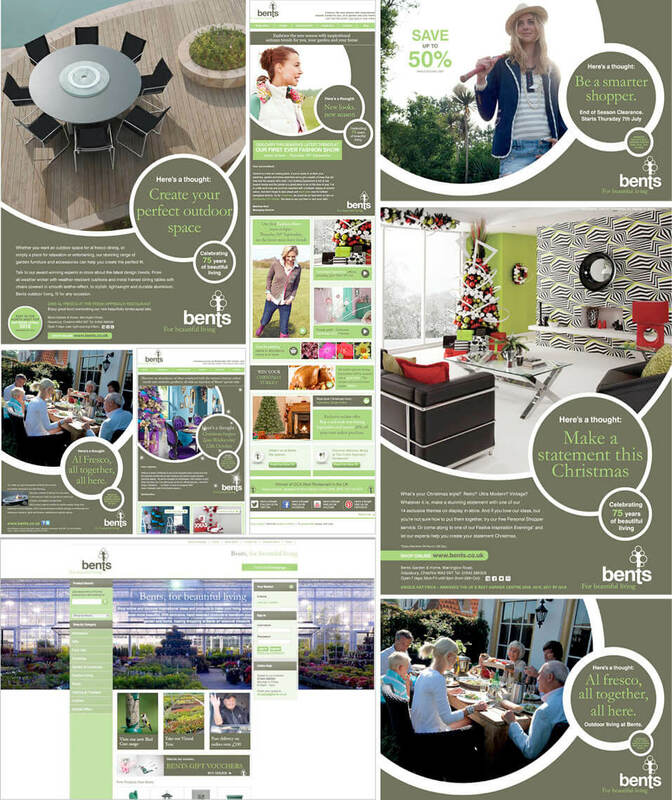 CHALLENGE: Extend Bents unique positioning, to further improve perceptions of an award-winning retail brand. APPROACH: Demonstrate how progressive the Bents brand is to shoppers from within 30-45 mins drive time. RESULTS: Significant year on year increase in footfall resulting in strong uplift in annual sales. Brand-building: ‘Here’s a thought’ concept and identity development, TV and radio advertising, lifestyle magazine advertising. Lead generation: Direct mail, email, targeted door drops, local press advertising. Conversion: Website design & build (Concrete5), in-store point of sale, print collateral, studio photography, video production. © 2017 Propeller. All rights reserved.